USPS, First-Class Mail, First-Class, Standard Mail, Certified Mail, Delivery Confirmation, Signature Confirmation are trademarks owned by the United States Postal Service. It takes the United States Postal Service (USPS) a lot more time, labor and money to sort mail manually than it does to scan barcodes electronically. Therefore, the USPS offers discounts on mail that carries a barcode and can be processed automatically. Barcoded mail (whether standard or first class) costs the USPS less to process, so they charge less. Most recently, the USPS introduced the intelligent mail barcode making sorting, mailing and tracking more efficient than ever before. Two service levels are available with the IMB – basic and full. MailCo USA sprays a full service IMB using the most technologically advanced system available. Barcoding mail is critical in moving today's mail. Experience the added discounts, increased visibility, and enhanced tracking available with MailCo USA's barcoding service. In January 22, 2012, the USPS (United States Postal Service) ruled that the second ounce is free for a first class automation or presorted letter, so TAKE ADVANTAGE OF THIS while remembering the maximum thickness is .25 inch. Save up to 30% in postage by redesigning parcels to flats. Flats must be rectangular in shape, uniform in thickness and flexible. When mailing non-personal letters and flats, consider standard (bulk) mail instead of first class mail. If your time frame allows, these rates are much less expensive. Especially mailing locally, delivery time is excellent for standard mail. Don't waste time and money mailing to people that have moved. Postage, material, and labor costs are wasted. Let us run your mailing list through the USPS system and update your addresses. This also insures that your message is delivered correctly and on time. Be sure that all your mailings are able to be processed at the lowest possible postage rates. Call us and let us review your mailpiece design and criteria prior to mailing. Sometimes a slight alteration of the mailpiece can lower postage costs and mail processing fees. A recent scientific study indicates that direct mail makes a deeper and longer lasting impression on people’s brains than digital advertising. Researchers used neuroscience technology to see which areas of the brain became active when participants viewed the same marketing message as a physical piece of direct mail and digitally on a computer screen; findings suggested the brain is more emotionally engaged and is potentially reflecting more on a response when viewing direct mail. Simply said, mail connects on a personal level by capturing the reader’s attention, interest and emotion. Marketing strategists know that direct mail supplies the strongest leads and conversions. While other channels are used in marketing campaigns, direct mail is often the primary vehicle. 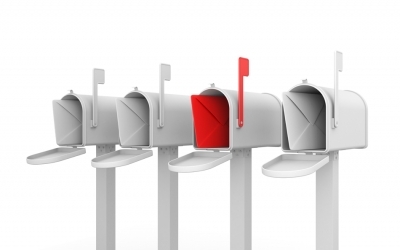 What Makes Consumers Open/Read Direct Mail? 40% - interesting packaging, design, color, etc. Thousands of different lists available that classify consumers.